The Polk Place mall on the campus of the University of North Carolina at Chapel Hill is a beautiful, open area, shaded by oak trees and surrounded by classroom buildings. In the cooler temperatures of late spring and the late day shade of the oaks, the dark green grass on the mall creates a beautiful setting for senior portraits. Dressed in her graduation gown and cap, her Masters hood and tassel, I had my senior sit naturally in grass. To ensure she was well lit, I used a off camera flash to provide the light to create this stunning image. The flash with a soft box was placed camera left, positioned to throw super soft light across her face and body and blend seamlessly with the natural sunlight tones. As I usually do, we took several shots here, some standing, some sitting. This picture turned out to be the standout of the set, mainly due her posing with such confidence and a little swagger. 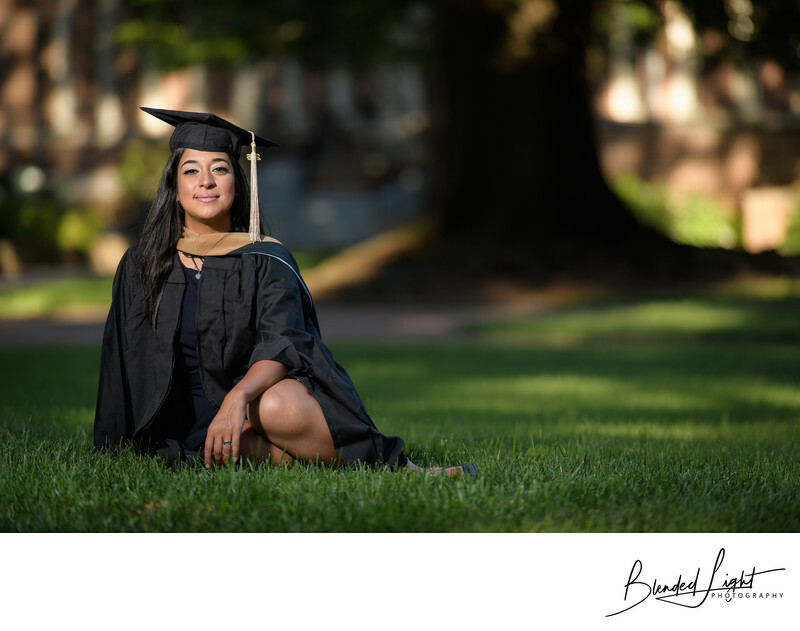 This senior session included two young ladies finishing their Global MBAs and both of them had great personalities and confidence that carried through the session images. The program is not for the faint-hearted as it is academically rigorous and requires two international trips for completion. Each senior was very different, so posing them required different approaches. This particular senior was a little more quiet and reserved than the other, so her posing is more reserved, which keeps with her personality. That's what makes senior photography so fun - you never know what kind of senior you'll get! Location: UNC-CH, Chapel Hill, North Carolina.